As the news of the Las Vegas shootings came out, I prepared myself to have conversations with the children, teens and families I work with about how this horrific event impacts them. Unfortunately, stories of shootings in schools, public spaces, or communities are no longer uncommon. As a parent, you may be wondering the best way to talk to your children about this type of violence. You may even question whether or not you should talk about it at all. Below are some tips to guide these difficult conversations. Where your child is at developmentally can impact how you choose to talk to them about violence. Their age, maturity and understanding of the impact the event has had can determine how much detail you go into. The American Psychiatric Association recommends a child be at least 8 years old before your discuss these topics unless they directly impact your family. For elementary age children, be prepared to answer questions. It may also be helpful to focus on the positive, such as talking about the great impact first responders have. For pre-teens and teens, let them share how they’re feeling and follow up with how they can help. This may be through making a donation as a family to the victims or discussing positive ways to give back to your own community. It is also important to be factual when having these conversations. Be sure to refute any rumors or unconfirmed details about these events. Let your child show emotion and teach your children healthy ways to cope with these difficult emotions. Encourage them to express themselves through activities such as art, music, writing and especially through talking to you or other trusted adults such as teachers or school counselors. Validate how they’re feeling by letting them know it is very normal for them to be scared, sad or nervous after hearing about the event. One thing you may want to monitor is their exposure to the event. Constant exposure or repeated images of a violent act can be distressing. Try to jump back to your normal household routine rather than letting the media coverage alter your normal family activities. Reassuring your child that they’re safe is one of your biggest roles as a parent. Children often wonder if it could happen to them when they hear about a tragedy. Talk to them about all the ways in which you, your child’s school and the community are working to keep them safe on a daily basis. An extra hug, special trip to the park, or one more story at bedtime are just a few small ways in which to show your child some extra love on difficult days like this. 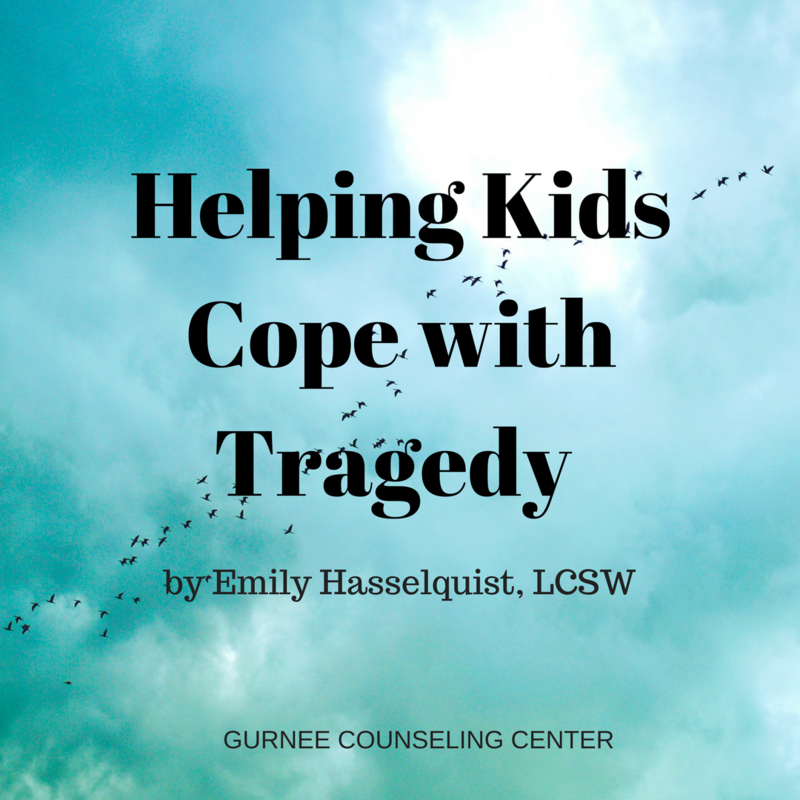 If there is anything the staff at Gurnee Counseling Center can to do help you process these types of tragedies, please don’t hesitate to reach out to us at (847) 336-5621.